Great views of Georgetown and I-70 corridor. Mt. Evans can be seen from the top. Endless switchbacks are impressive. Old log cabins scattered along the route. Don’t miss historic Georgetown and a new visitor center. Parking space is limited at the bottom. Unlicensed vehicles should consider accessing the area via Cascade Creek, Trail #61, where there is more parking. Narrow road in spots is prone to rock slides, especially after periods of heavy rain. Conditions can change quickly. The road is rocky and bone jarring but suitable for stock, high clearance SUVs under normal conditions. Stay off road if snow covered. Several more large boulders have fallen and I now rate the trail DIFFICULT. People have stacked rocks to get over the boulders, but I was challenged to get through in my stock Jeep Wrangler Sport. The rock cliffs above the trail are not maintained or reinforced in any way and, in my opinion, this trail is DANGEROUS!!! Hopefully, some future maintenance on the trail will make it safer. Trail is adopted by NAXJA, the North American XJ Association. 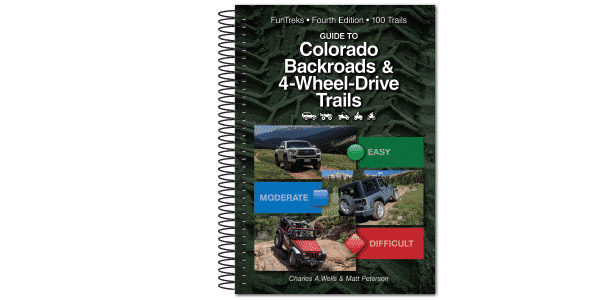 For up-to-date pictures of this trail, see our new 4th Edition of Guide to Colorado Backroads & 4-Wheel-Drive Trails, set to be released for sale in mid-April of 2019. 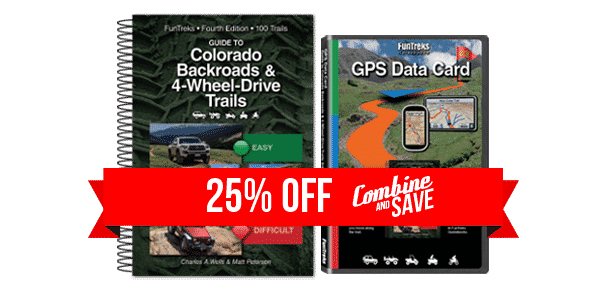 In our ATV Guide Colorado Central Mountains, we combine this trail with “Cascade Creek” which is shown as a separate trail on this website. 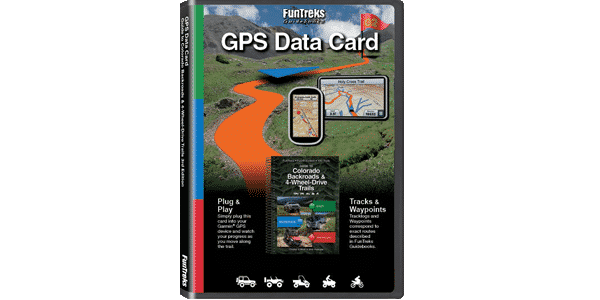 The upper part of Cascade Creek between Waypoints 02 and 08 in this ATV book, has gotten more difficult, although a skilled ATV rider shouldn’t have much trouble. Great time today on Saxton Moutain. We approached over Mt Evans side from Cascade Creek trail. A few hair raising moments. The two very narrow passes on Saxton by large boulders gave me pause. (a good pic of someone is on web site) Also, one huge rollercoaster up, down, boulder, whatever, just drive and pray. The note in the book very true "Very rocky most of the trip" applied to all 17 miles; from start of Cascade to bottom of Saxton, took 4.5 hours incl breaks. Training my son today. One hit to skid plate, one scrape on diff. Stock 2013 Wrangler Sport, 2door,17in Goodyear Duratrac's, we had bare minimum equipment, don't attempt with anything less. Some tight turns, glad we have tight turning. All in - a great trail. Gets the adrenaline going.